The Elite trailer will hold up to three cars, two up top and one on the bottom. It is equipped with three axles and is 56 feet long. 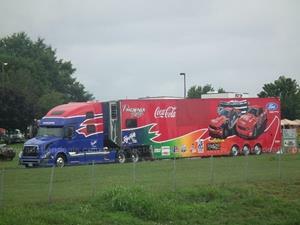 The exterior is bright red with numerous sponsor decals including Coca-Cola, Goodyear, and Ford, to name a few. The interior of the trailer is equipped with a seating and lounge area, with television, in a modern dark gray and black color palette. Additionally, the trailer includes a kitchenette area and a state-of-the-art restroom with shower. Black cabinets and stainless-steel countertops line the walls of the trailer, providing plenty of storage. The trailer is said to be in immaculate condition with no known defects or issues. The condition of the trailer can be viewed in the detailed photos provided on the AuctionDeals website. All interested buyers must be a registered bidder on AuctionDeals.com in order to bid on the trailer before the auction end date, January 29th. Bidder registration is easy and free and can be completed on the AuctionDeals bidder registration page. AuctionDeals is a marketplace of Liquidity Services. Liquidity Services (NASDAQ:LQDT) operates a network of leading e-commerce marketplaces that enable buyers and sellers to transact in an efficient, automated environment offering over 500 product categories. The company employs innovative e-commerce marketplace solutions to manage, value and sell inventory and equipment for business and government sellers. Our superior service, unmatched scale and ability to deliver results enable us to forge trusted, long-term relationships with over 11,000 sellers worldwide. With over $7 billion in completed transactions, and over three million buyers in almost 200 countries and territories, we are the proven leader in delivering smart commerce solutions. Visit us at LiquidityServices.com.